A quick moving but weak low pressure system will bring a light accumulating snowfall to Brookfield Thursday night, January 17 into Friday morning, January 18, according to the National Weather Service (NWS). A more significant storm system will impact the region over the weekend, bringing the potential for snow and heavy rain Saturday night, January 19 into Sunday evening, January 20. Strong winds will bring an arctic blast Sunday afternoon into Monday. 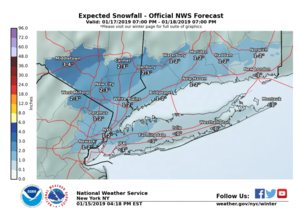 The National Weather Service is predicting 2 to 4 inches for interior portions of northeastern New Jersey, the Lower Hudson Valley, and Southwest Connecticut and one inch for NYC/NJ metro and surroundings before a changeover to rain. Less than one inch is predicted for Southeastern LI and CT before a changeover to rain. Travel is expected to be hazardous due to poor visibility and snow covered roads, particularly across the Interior, for the Friday morning commute. In the wake of this system, a blast of arctic air is expected to rush into the region Sunday afternoon into Sunday Night, with the coldest air of the winter season expected into early next week.